The Treatment of Americans Abroad embodies great respect and friendship, for the most part. Most people respect and even love Americans, especially because they have family and friends living in America. I can't tell you how many times I've been asked if I knew someone's bother, "Hamal," in Baltimore. I didn't. But there can be problems, especially when it comes to certain aspects of American culture, such as clothes, music and McDonald's. Sometimes Europeans have over simplified views on how Americans think. Like the time a Dutch student accused me of thinking all Dutch have their fingers in dikes preventing them from flooding their villages. I was taken aback, wondering if this person had another stupid viewpoint to offer. He didn't, and the incident soon resolved itself. Yet, is this any different than if Americans think all Dutch wear wooden shoes? Travel can help correct these misconceptions with everyone, everywhere. Next, people abroad do not like their culture overridden, especially by their own people. For instance, I found this poster. 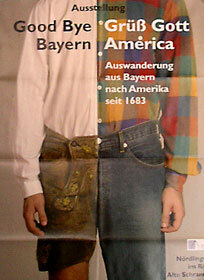 With a picture of Lederhosen on the left and jeans with plaid shirt on the right, the sign reads, "Good Bye Bavaria, Hello (God's Blessings) America." America does like to pick up and run with a good idea, no matter where it comes from. Sometimes people blame others for their own unhappiness and misfortunes, or they maybe they're just plain jealous. In any case, emotional complaints seem to be in vogue, and America has become an easy target. Thus the treatment of Americans can get a little rough. So with a little hope and a lot of tolerance, the people of the world can get along. Americans can come to realize they have many more friends than enemies. Travel has a great way of overcoming misconceptions and making friends out of strangers.